Today marks the date that, five years ago, Eraserhead Press hired its first employee. 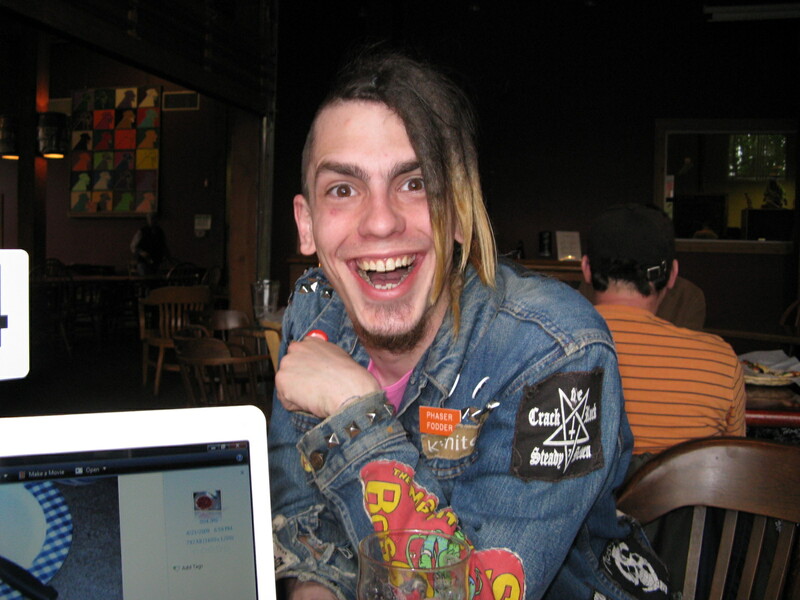 After nine years of being a DIY operation, in 2008 Jeff Burk moved across the country from Pittsburgh to Portland with the dream of working for Eraserhead Press. 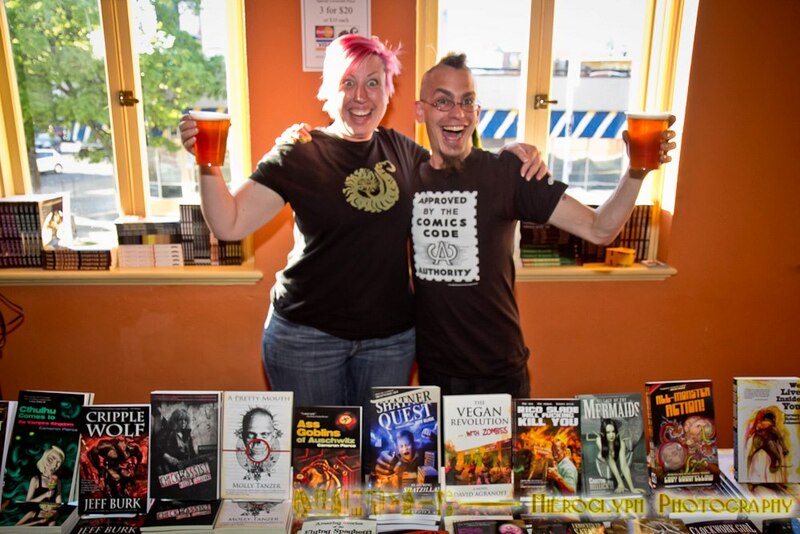 When Jeff arrived in Portland, I didn’t know much about him except that he was a fan of Bizarro Fiction and an avid reader of our work. I invited him to a gathering of local writers that I hosted once a month. Jeff arrived early, and had spent the last of his money on a bus ticket and a six pack of beer to share. Upon meeting him, I liked him immediately. 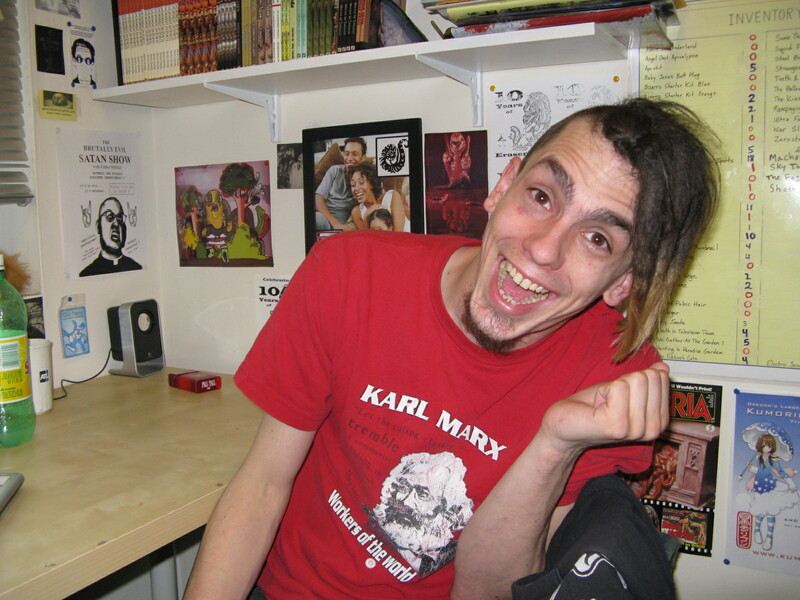 He was an outgoing punk geek with a quick wit, fun sense of humor, great personality and best of all he loved the books I published. He told me that he felt that Bizarro Fiction was the future of literature. He said that he had given up reading fiction completely until discovering books by Carlton Mellick III and Brian Keene. He said that he felt that aside from TROMA films, we were the only other company producing anything relevant in entertainment media. Jeff was so passionate about what we were doing, that he volunteered to work for free and to do anything that I might require of him, as long as it meant being involved in the vision we shared. His college degree was in political science, had little experience with publishing beyond being a book reviewer, and had no knowledge of the industry. But since I am someone who believes that passion is the key to success, I gave him a job. Turns out it was one of the best decisions I have ever made! For the next two years, Jeff sat next to me, literally about two feet away, crammed into a tiny office space where often times he even had to sit on the floor. He threw himself into the business, completely changing his entire life and giving up everything else for a period of time. His background in political science, activism, and campaigning had prepared him surprisingly well for a lot of the challenges he was to face in the publishing industry. Networking with others came naturally to him and his skill with public speaking and marketing were great assets to our company. Jeff brought new life to Eraserhead Press, not only with the projects he completed, but because his commitment helped me to affirm my own. Fast forward to five years later. Jeff is making his living entirely off the money he generates from the Press. He has authored four books, helped create The Magazine of Bizarro Fiction, hosted numerous reading events, panels, and book release parties, edited over sixty books, and become the Head Editor of our horror imprint Deadite Press. Now he is publishing the very people that inspired him to begin reading again like Brian Keene, Carlton Mellick III, Edward Lee, and Wrath James White. As well as discovering and helping to develop new voices such as Garrett Cook and Shane McKenzie. Jeff and I have one of the best working relationships that I have experienced in my life. He is one of my most trusted allies and friends. He is loyal and smart and he brings a special kind of magic to what we do. Both of our lives have changed dramatically in the time we’ve worked together. We’ve been to hell and back. We’ve seen the best and the worst sides of each other. And through it all we’ve had more fun than I can even possibly begin to describe. Happy anniversary, Jeff! Thanks for making me a boss for the first time. I look forward to the next five years!